Hospital-acquired infections cause major issues in hospitals around the world, including sick leaves and deaths. In Denmark, an estimated DKK 1B in annual healthcare expenses and 3.000 deaths are preventable. In other EU countries, the numbers are much higher, and in the U.S. preventable annual expenses are estimated at USD 30B. The autonomous UV-Disinfection robot is a solution to control this. Developed and produced in Denmark by UVD Robots, these robots kill 99,99% of all bacteria in an average patient room by the use of UV-C light (short wavelength ultraviolet light) in approx. 10 minutes. The UV-C light irreversibly damages the DNA of the superbugs, bacteria and viruses, preventing them from regenerating and multiplying. Blue Ocean Robotics is the founding company and main shareholder of UVD Robots, which was established in 2017 and has been accelerating its growth successfully since. 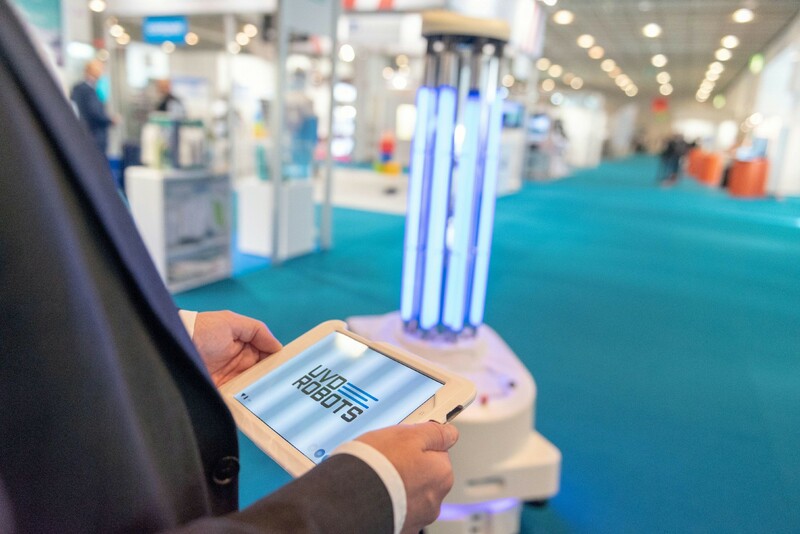 In February 2019, the UV-Disinfection Robot was officially launched in London at the IPC 2019 annual infection prevention and control conference. The previous month, we exhibited at Arab Health in Dubai, where the UV-Disinfection robot gained great interest from Middle East customers. We are on a fast track expansion of our global distribution network and currently have distributors in 20+ countries. Our UVD Robot was put to the test against these so-called “difficult to kill” organisms by a leading accredited laboratory in the UK, Melbec Microbiology Ltd., in January 2019. The test showed that our robot killed the superbugs! The “inverse square law” governing light confirms that if you are able to radiate UV-C onto surfaces from short distances, you will gain optimal levels of UV-C power. The closer the source of light is to all surfaces, eliminating shadow zones, the more effective the disinfection will be, which is only possible with our autonomous UV-Disinfection robot. Not only are we extremely honored about how our UV-Disinfection robot has been received by the healthcare industry. We are also positive that our robot will make, and already ismaking, a difference for hospitals globally. Even though we have achieved great results with this robot already, we are committed and deeply engaged in developing the next generation technology. We continue to grow our business, and already we can share the news of establishing our own sales company in the UK by April 1. It’s a great opportunity to get a strong foothold in the market and a huge benefit for the UK healthcare sector. Shared reading from the Nordic Eye family.